Food has always been central to Jessica Seaton’s life. The proof is in TOAST, the name she bestowed upon the lifestyle brand that she co-founded with her husband, Jamie Seaton, twenty years ago. From its inception, the brand has always stood out for its thoughtful and functional clothing (him) combined with a distinct and evocative imagery for which their catalogues and look books are infamous (her). 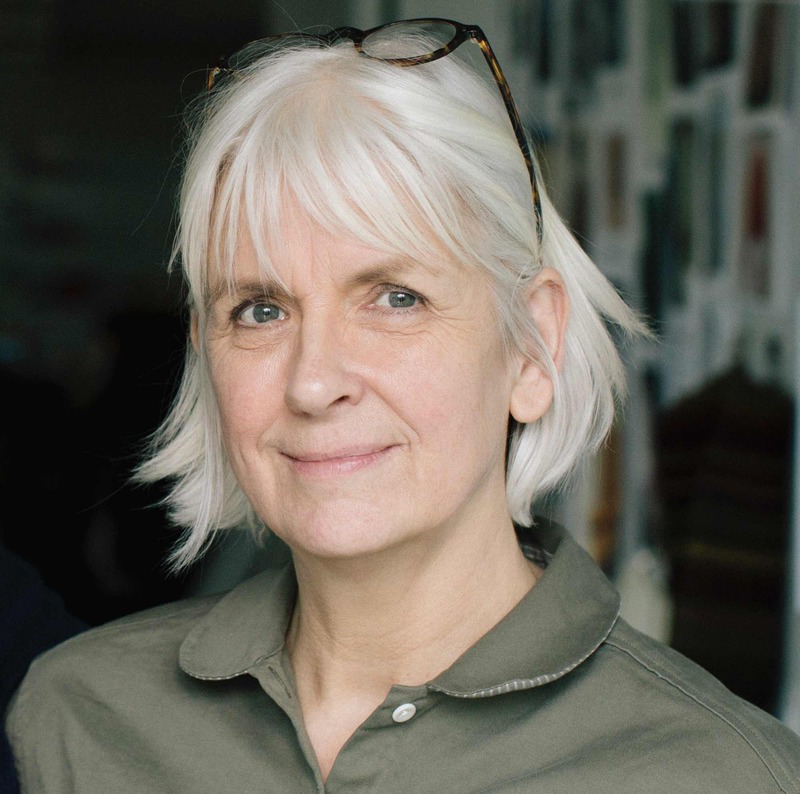 The clothes are a firm favourite amongst creatives like Polly Leonard, the founder of Selvedge Magazine and Deborah Thomas, of Doe Leather. 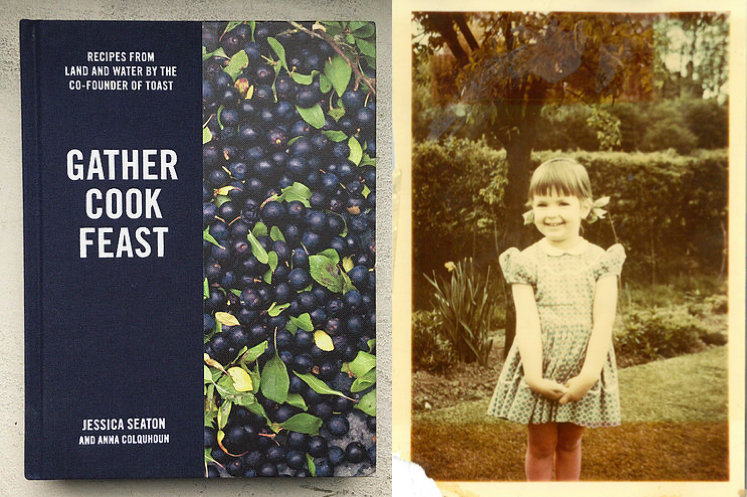 With the launch of her first solo project, recipe book “Gather Cook Feast, Recipes From the Land and Water”, Jessica explores her fascination with the relationship between food and the landscape from where it comes. And acts boldly on her desire to create, “a plate that feels like a place”. The book’s recipes — over one hundred and twenty — and its accompanying photographs transport you to a world where the body and soul are forever noursished. Think TOAST but this time with an edible result. The offer and Jessica are difficult to resist. Read on and see why. Above: Jessica Seaton, author of “Gather Cook Feast” and co-founder of Toast. Photograph by Elena Heatherwick. Fabulous Fabsters: Your creativity is inextricably linked to your family and surroundings. Please tell us a little about how that started. Jessica Seaton: I have built two businesses with my husband, Jamie. 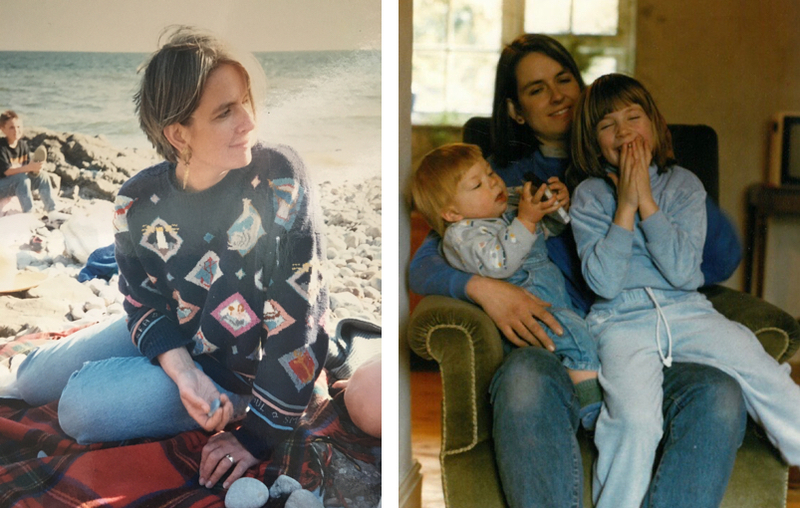 The first, a knitwear business, started as a very small seed of an idea, but after a couple of years, through coincidence or application, we found it developed its own momentum. That business opened our eyes to the world. And when the momentum faltered we decided we needed a change and so we started Toast, which has been our life and inspiration since. Above L: An image from the TOAST Autumn 15 collection. Above R: OAS — Ordinary Attire Studio — Toast’s workwear line was introduced in September 2016. 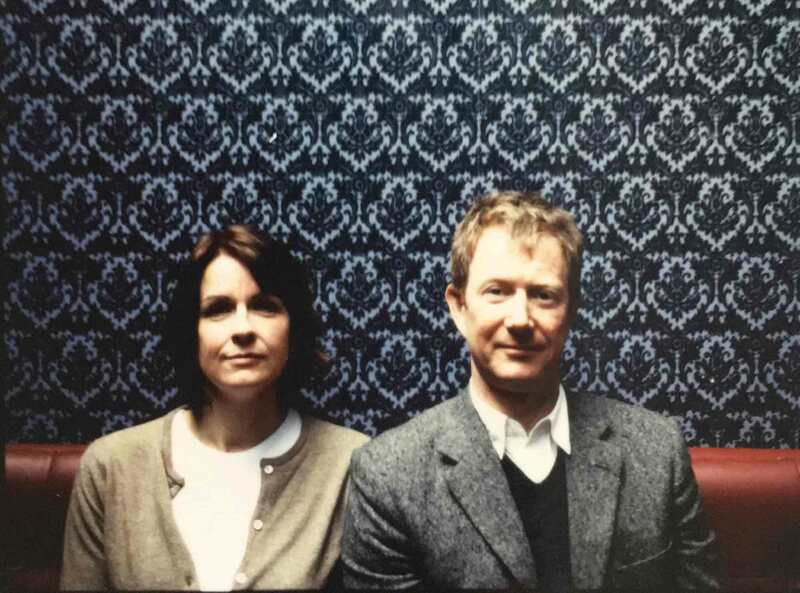 Bottom Centre: Jessica and Jamie Seaton pose for an early Toast photoshoot. Photography by Chris Tubbs. FF: What was your inspiration for your first solo project, “Gather Cook Feast”? JS: It was really about the coming together of two things that I deeply love – food and landscape. When asked what sort of book we might like to publish the idea came from nowhere with such conviction that it couldn’t be ignored. Thus I can now combine my work at Toast, working with photographers and designers with my love of food, cooking and landscape. “Gather Cook Feast” is about food as an expression of landscape – a plate that feels like a place, if you will. I am interested in food and this sense of place, the tingle down the spine, loving life, discovery and the reward of a job well done, science, a new world, arranging words, empty spaces, Japanese aesthetics, the wilderness, gloomy music, the profound, making a new world, cherishing the natural world, being buried on a bed of wild flower hay. 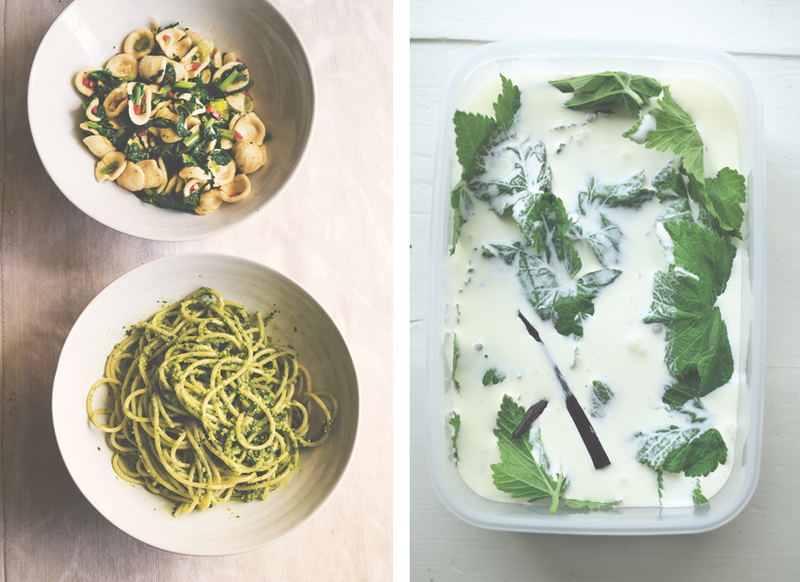 Above: A selection of images from the ‘Freshwater’ chapter of “Gather Cook Feast”. Jessica collaborated with professional chef and culinary anthropologist, Anna Colquhoun to develop the recipes for the book. Clockwise from Top L: Wild Garlic Pesto Spaghetti and Bitter Green Orecchiette. Top R: Blackcurrant Leaf Cooked Cream. Photography by Jonathan Lovekin. Bottom Centre: A fresh water stream in early spring. Photography by Nick Seaton. FF: The images in the Toast look books consistently evoke a “sense of place”. Can you discuss how this developed into “a plate that feels like a place”? JS: It is true that Jamie and I have always wanted to build a sense of place into the books Toast has published over the years. It was never a plan, we just responded to the beauty we saw, especially seen through the eyes of some of the amazing photographers we have worked with. We have always thought that the making of the clothes and taking of the photographs as two halves of the work – a completion of the work if you will. It becomes more than just making a pair of trousers or a dress. And we always wanted to express something amazing: something to open the eyes and heart. This the aspiration — how much we succeed is up to others to decide. And so with “Gather Cook Feast” it is the same impulse applied to food. I wanted to create a deep connection between place and the foods you take into your body and are sustained by. There is an intimacy to eating, the play of texture and taste in the mouth and I love it when foods evocatively betray their origins: a flinty wine from a limestone plateau; the sweet-salty taste of lamb grazed on the sea marshes; the intensely autumn-y taste of a meaty cep. It’s all wonderful to me. 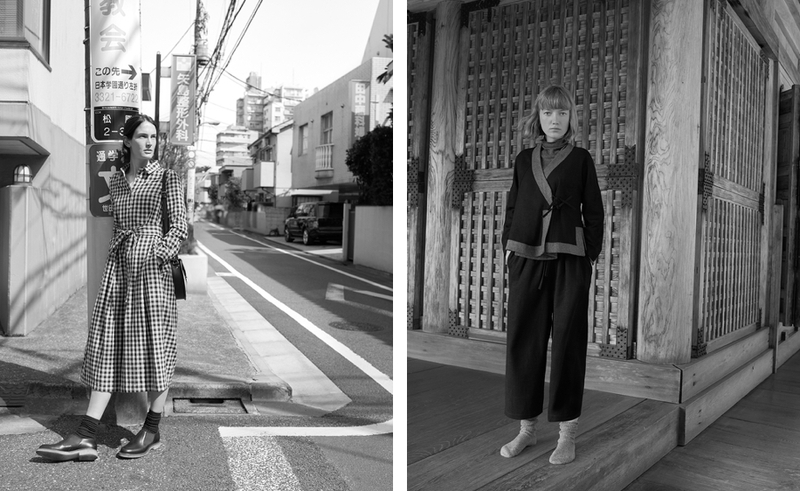 Above: The TOAST AW 16 collection was photographed on location in Japan. FF: The relationship between the landscape and food is a powerful idea that you explore in depth in “Gather Cook Feast”. Please elaborate on how you expressed the inextricable ties between the two in your choice of images and words. JS: The book is arranged into six chapters that take you through the year; ‘Freshwater’, ‘Saltwater’, ‘Home Ground’, ‘Field & Pasture’, ‘Heath & Wood’, and ‘Upland’. For me each place had a felt atmosphere and I wanted to communicate the individual feeling of each — a time of year, its colours, its flavours. And so, for example, the ‘Saltwater’ section is not only about fish and seaweed, which come from the sea; but also about brining, lemon and pickles, which feel somehow like the slap of a sharp wave when swimming. In another example, the opening chapter, ‘Freshwater’, is full of green — that vibrant spring growth, which is sometimes so green it can hurt your eyes. Each chapter starts with a list of words that express these feelings I have for each place and are interspersed with ingredients that are from each place. 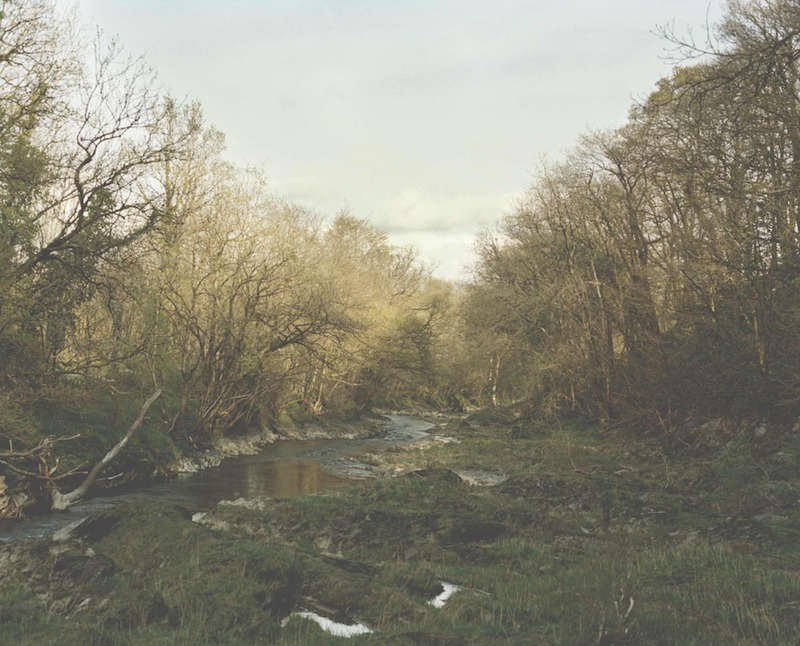 There are also photographs of each landscape, taken by our son, Nick Seaton. He captured these images by touring the country over the course of a year. 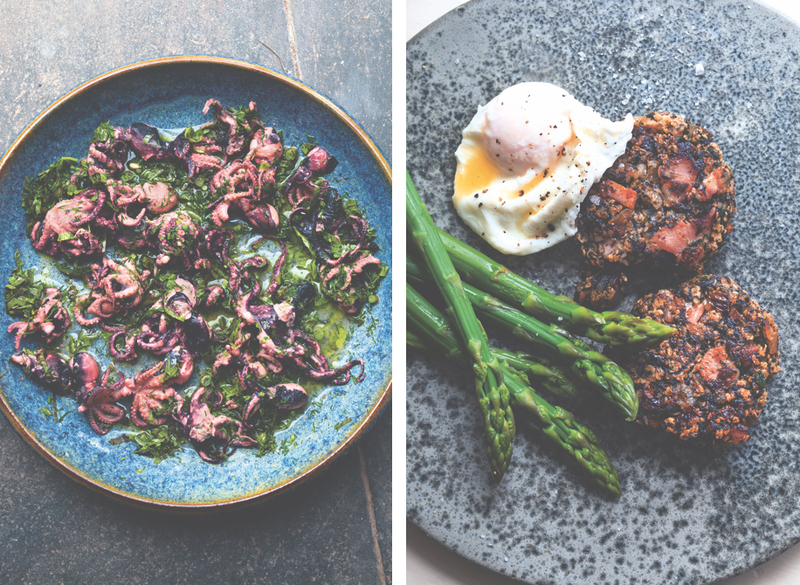 Above: A selection of images from the ‘Saltwater’ chapter of “Gather Cook Feast” Clockwise from Top L: Grilled Octopus with Lovage & Dill. Top R: Laver & Oatmeal Pancakes with Asparague & Poached Egg. Photography by Jonathan Lovekin. 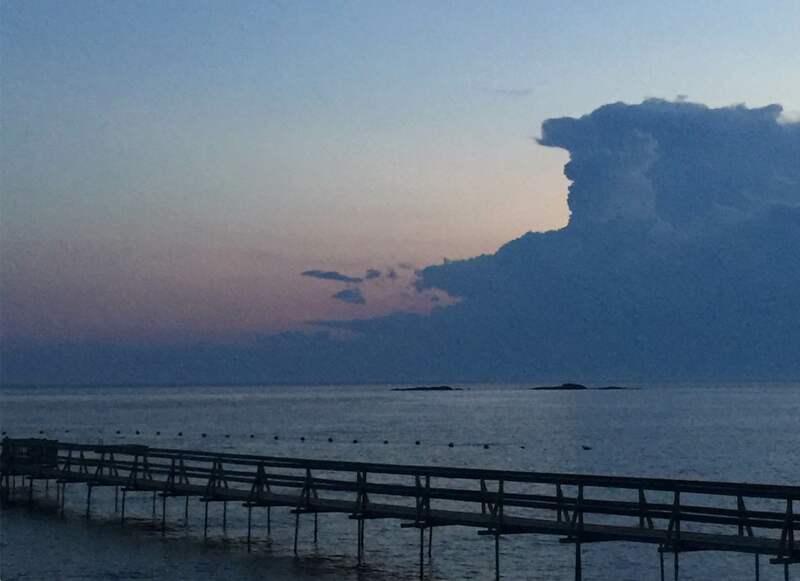 Bottom Centre: Dusk on the Long Island Sound in New England. “When I imagine these landscapes, I imagine them in the British Isles, but they could equally be transferred to similar landscapes in France, Connecticut or any other temperate land,” Jessica says. Photography by Christine Chang Hanway. 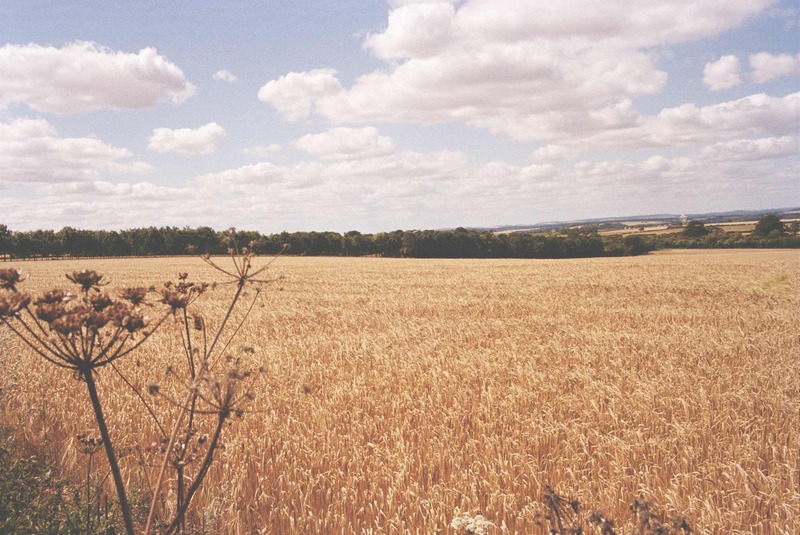 FF: Please tell us how this relationship between the landscape and food clearly nourishes your mind, body and soul. JS: I have been thinking about this a good deal lately and am cautious about being too evangelistic. But I think many people feel the need to have a relationship with the natural world and that living in cities where it’s hard to see the sky and stars can weaken that connection. Your eye cannot roam the distance and that makes it hard to step out with an uninterrupted stride. FF: How does foraging fit into this for you? JS: In “Gather Cook Feast”, I intentionally use a selection of foraged ingredients. Mostly because foraging is an enjoyable practice — getting out into the open air and eating foodstuffs packed with nutrition and complex compounds that have been bred out of many domestic cultivars. It’s very rewarding and the foods you can find are rich in vitamins and minerals as well as tasting, well…. more alive and wild. FF: How might the uninitiated begin to forage? JS: To begin foraging is to reconstruct a knowledge that has, until quite recently, largely been lost to the vast majority of people. If you don’t know your way around the British flora, it will be best to take a course first and then to equip yourself with some good foraging books — I recommend some courses and references in the book. And finally practise, practise, practise. The easiest plants to start with are some of the more well-known ones: blackberries, nettles, elderberries and elderflowers. They are also some of the most delicious. 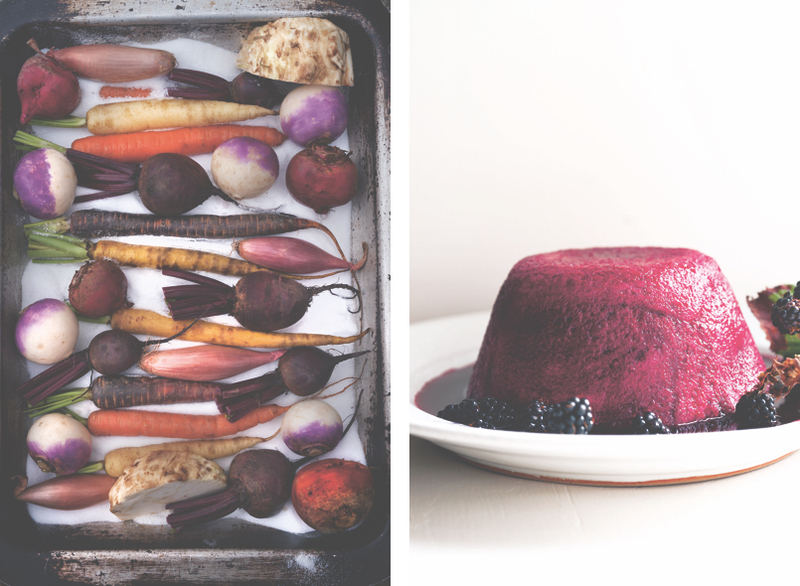 Above: A selection of images from the ‘Field & Pasture’ chapter of “Gather Cook Feast” Clockwise from Top L: Salt-Baked Vegetables. Top R: Hedgerow Pudding. Photography by Jonathan Lovekin. Bottom Centre: A field of hay. Photography by Nick Seaton. FF: Your memories of your childhood home are, thanks to your mother, filled with “the scent of cooking and the energy of possibility”. What memories do you think your children have of you and food? JS: The memories of my mum’s food are quite simple really. Her food wasn’t elaborate but she cooked very well indeed and was always curious about new tastes and new ideas. There was a wonderful generosity to the way she cooked – whether it was a wonderful impromptu picnic with roast chicken, crusty bread, tomatoes and red wine or a Sunday tea with the lightest of sponge cakes’ oozing cream and fruit. She made the best trifle I have ever tasted and when I was very young and hanging around stables, the other stable hands used to plead with me to ask her if she would also make them the two-layer, over stuffed baguette sandwiches that she made for my packed lunch. She did too! All this was years ago when sandwiches were mostly made with a sandwich spread that came from a jar. I had to ask my children what they remember. Rachel said she remembers artichokes, and skate with capers and beurre noir. Nick said he remembers the sounds of my cooking when he played in the garden on summer evenings and school packed lunches that were embarrassingly smelly. FF: What would you like the reader to take away from “Gather Cook Feast”? JS: I would love them to just enjoy cooking and eating the food, to feel a sense of space and open air and to be tempted to try something new. Above L: Jessica models a sweater designed by Jamie from the knitwear company they started before TOAST. Above R: Jessica with her children, Nick and Rachel on her lap. JS: A good while ago I embarked on the Marie Kondo de-cluttering and suddenly realised what my style was! I would recommend going through this process to anyone who is unsure about their style. The remaining items left on my rails and in my drawers were very consistent and clear in their simple shapes, style, proportion and neutral colours. And buy better if you can. JS: Neal’s Yard Yoghurt, nuts of all sorts, good sea-salted butter, best Tuscan olive oil, bang fresh free-range eggs, a good block of very well made artisan cheese, a loaf of sourdough bread, a bowl of tomatoes kept out of the fridge, a large bulb of garlic and anchovies. 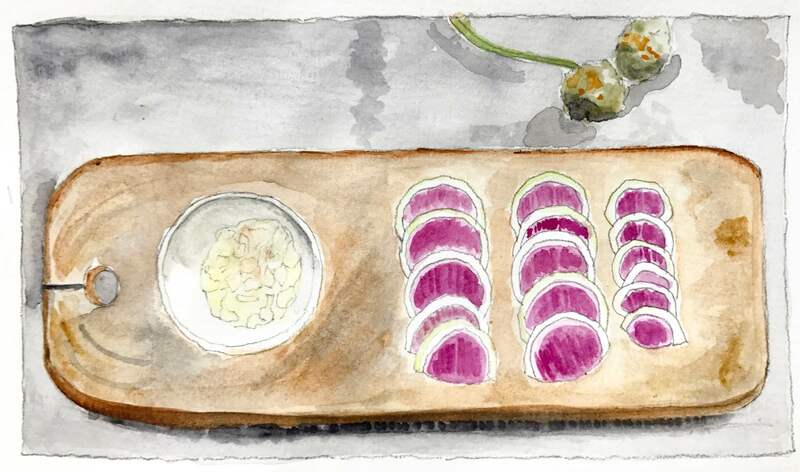 Above: A plate that feels like a place — Rainbow Radishes. Artwork by Christine Chang Hanway inspired by a photograph form Jesssica’s Instagram feed where you can stay up to date with Jessica’s culinary adventures. JS: Yoga, pilates, walking and Buddhism. Above L: “Gather Cook Feast” by Jessica Seaton and Anna Colquhoun is published by Penguin and is available in the UK on Amazon. The international edition will be available in August, 2017. Above R: The future forager, Jessica Seaton. A Fabulous Fabster thank you to Jessica Seaton! Honestly can’t tell you how much joy this blog brings me! Lovely to see you posting more often lately. The space is so energetic and intimate.